Let me start by saying that we are very fortunate to have acquired this card. Many other companies have not figured out how to do it for their expats and there are a lot of people who have been living here much longer than us without cards. Instead, they make trips to Congo or Cameroon every few months to renew visas. Nestor begins by preparing all paperwork. I can’t actually tell you what is on this paperwork as he has someone fill in all of the information and I never actually saw it other than to sign the bottom. Every other day, Joe gets an urgent call from Nestor’s office saying that they need our passports NOW. Joe complains as he is busy at work and can’t drop everything to drive home, pick up the passports and take them to his office… but he does it anyway. This paperwork is sent away, to where I have no idea, and eventually returned with an all important stamp/press seal of approval. Upon returning to Gabon, we present the original papers that were returned to us, to an immigration officer. It is extremely important to have everything perfect. The papers must be the originals, not copies, the stamp must be in the correct place, the dates must be correct, and we pay 45 000 cfa ($90.) The officer looks everything over, scouring for loopholes so that you can be denied. If you aren’t, they scan your fingers, take your picture and provide you with a temporary 30-day visa. They stamp the papers and return them to you and send you on your way. Nestor anxiously awaits the new visa and stamped papers to begin filling out the second round of paperwork. He resumes calling Joe every other day demanding passports or signatures until everything is in order and then a trip to Libreville is booked. We catch an early morning flight to Libreville and head directly to the immigration office. Nestor has some sort of connection there as we bypass lines of people waiting outside and head directly to a side door. It is very important to be dressed nicely as people have been turned away at the door. Upon entering, we are shuffled on to a bench where 5 people, no more, no less, must sit and wait. You sit for several hours trying to figure out how everything works because no one actually tells you anything. Nestor tells us to listen for our names to be called which is impossible because they call from the other side of the room and there are a hundred other people shuffling about and talking. It appears that Nestor has some sort of deal with one particular immigration officer who may or may not have been paid in order to let us jump the line. After 2 hours of waiting, I am called forward and surprisingly Nestor accompanies me. Prior to this, he wasn’t allowed to help unless there was a problem. The officer scours the papers and finds something wrong with them. He demands that Nestor explains but never accepts the answer, scans my fingers, and directs me to sit back on the benches. Half an hour later, I’m called to a different man who looks over our ‘offenses’ and assigns a penalty (the going rate for us white people seems to be 300 000 cfa or about $600.) We are then directed to the cashier to pay the fine. We resume sitting on the benches waiting for our names to be called again, this time for the photo. Once called, I enter a cubicle and answer a few questions, have my fingerprints scanned again and get the photo taken. I resume my place on another bench and again, wait for my name to be called for the fourth and final time to receive the actual carte de sejour. Voila, process is complete. Nestor swoops up the card telling me that he needs to take it for one reason or another but assures me I will have it in my hands in a few days. To recap… 2 trips to Pointe Noire, an infinite number of trips to Nestor’s office, 4 passport photos, a wedding, a day at the immigration office in Libreville, several thousand dollars, 4 months of frustration but I am the proud new owner of a Gabonese Carte de Sejour. If we’re still here, we’ll get to do it all over again in 2 years! Every visit to an airport in one of these smaller African countries is an experience. Most of the time it is hectic, unorganized and frustrating but yesterday was relatively smooth... except for 2 small things. Apparently, the leader of the opposition party was making his arrival in Libreville (probably from Port Gentil as I think he resides there as do many of his supporters) just after we were to depart and he invited his supporters to meet him at the airport for a march to the government offices. Those of you who travel know that everyone tells you to stay away from any political protests as they have potential to become dangerous. Unfortunately, we had no choice as we had a flight to catch. I was a little nervous by all the red shirts (the colour of the opposition party) taking over the exterior of the airport. Luckily, nothing much happened while we were there. There was some singing, marching and cheering but by this time, the army showed up, shot guns and all and corralled people outside. I haven't heard what happened afterwards but thank goodness it remained peaceful while we were there. While in Pointe Noire, Joe purchased a regulator box to plug our TV into as the electricity fluctuates so much here that we worry it could damage our bigger electronics. We were a little concerned as it was 8 kg and we didn't want to be overweight so at the last minute we moved some of Joe's things into my bag. We checked in, left our bags and returned to the main area to look at some magazines. As we were standing around, I hear the distinct name Joseph Thomas Reid (with a very French flare and Reid is always pronounced Red) being called over the intercom. Of course, Joe hears none of this so I get his attention and we report to baggage. Well I guess a regulator looks like a bomb in the scanner so we had a bit of explaining to do. After we opened the bag for them and explained what it was, all was fine, but funny nonetheless. In the end we made it home safely but unfortunately, I have one more trip this week to Libreville for the final step in the residence card process. I wonder what excitement awaits me then. This week we had to leave the country to get things rolling with my residence card (that will be another post) so we had to spend more time in Pointe Noire. If you remember, we did this a few months ago and really were not fans of the city (see previous post.) Joe had a lot of work to catch up on so we spent a lot of the time in the room which was fine with me… the incessant honking by the taxi drivers was enough to drive me crazy! On our way back to Gabon we had to go through Libreville (customs/immigration) and we arranged to stay the weekend to car shop. 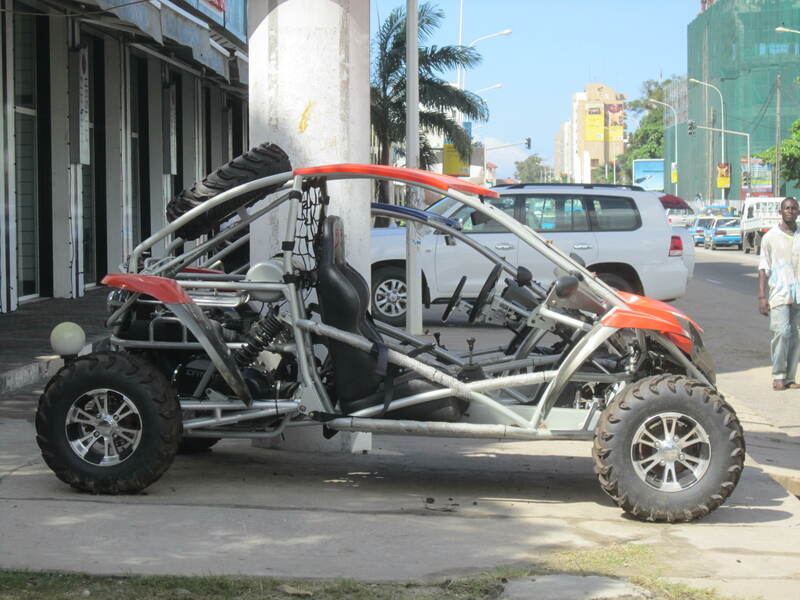 There are cars in Port Gentil but selection is limited and we just weren’t finding exactly what we wanted. This was my first time in Libreville in the daylight (we usually arrive at night and fly out again in the morning before the sun comes up) and I was pleasantly surprised. It actually seemed like a nice city, at least from what we saw of it. 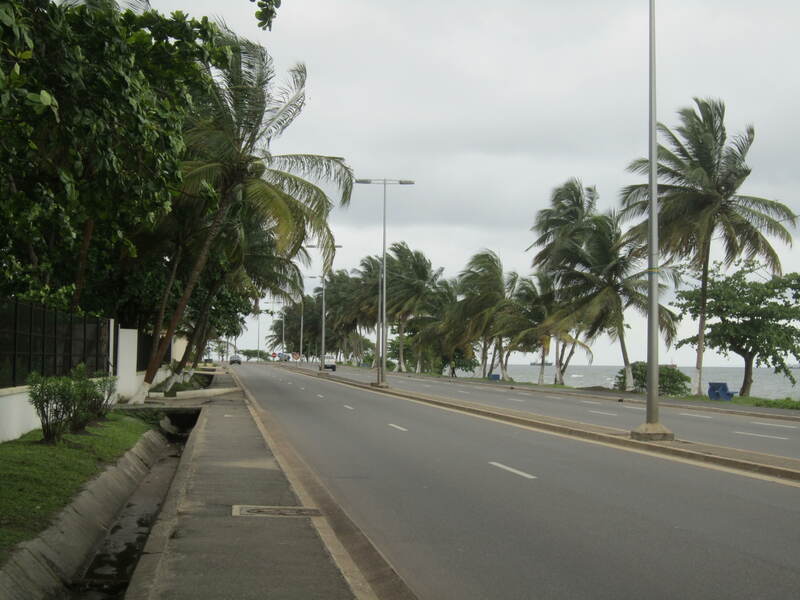 The main road along the ocean in Libreville. 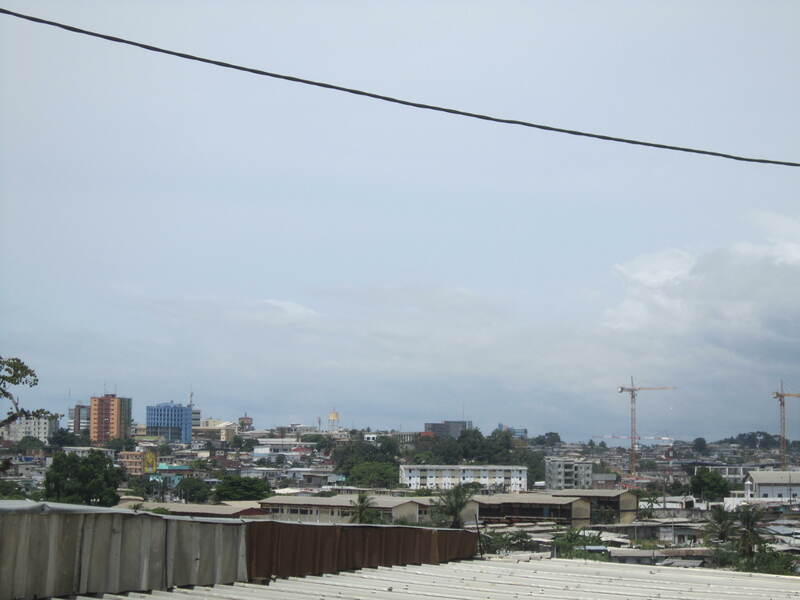 A view of Libreville from above. Our wishlist for a car was a smaller SUV with 4x4 (preferably Toyota or Mitsubishi as those are the most common and easiest to fix here,) in relatively good condition, automatic transmission and less than 10 000 000 FCFA (approx $20 000 CAD.) Yes, that is a big budget for a used vehicle however as with everything else here, cars are EXPENSIVE. A typical car is close to double what we would pay in Canada for the same vehicle and it is much more difficult to fix when something breaks. Saturday morning we had our breakfast and hired a driver to take us around to the shops. Mr. Moussa happened to be waiting outside the hotel and he was the perfect match for car shopping. He took his job seriously that day and was just as involved in the search as we were. He didn’t speak any English and neither did many of the salesmen so it really put my French to the test. I was translating left, right and centre and for the most part we got along pretty well. We decided on a 2001 Rav 4 as it hit our entire wishlist. We aren’t out of the woods yet as the money needs to be transferred, inspections need to be done, and it needs to be put on a boat to Port Gentil. I probably don’t need to mention that we are in Africa and while we are optimistic, the past has taught us that things don’t go smoothly here so we are preparing ourselves for several frustrations and headaches. I’ll be happy if we have our car by the time we head to Canada for Christmas. We have officially moved in to our house, problems and all, and I am often asked, "Do you plan on getting a ménagère?" So what is that, you ask? Well, it's a housekeeper. Every time someone comes to the house or hears about our house they ask. This week the men came to spray bugs and when they realised I was sans ménagère, the man left me his number because his sister is looking for a job. The head maid in the hotel left me her number and a lady at Joe's office has also mentioned she knows many good women for the job. They can be hired for about 150 000 CFA per month (about $300) plus taxi fare which is another 10 000 per week and they will clean your house 5 days a week morning until night! If you've ever inquired about hiring a house cleaner in Canada, you will know that this is very cheap. Every expat household I know, with the exception of one, has hired a ménagère. It's a two way street: the expats like the thought of cheap help to do the dirty work and the locals expect the wealthy expats to provide jobs for their people. It is just Joe and I here so if you ask me, do we need a ménagère, the answer would be no, of course not. If we decide to hire someone, we would only have her come a few times a week and maybe not even for the full day. Now that we are actually living in the house, I've been tossing the idea around. -We provide a job to someone who might not necessarily have one. -We have 2000 sq feet of tile floors that need to be swept and washed almost every other day. It's a big job and I don't like doing it! -We do not have a dishwasher and it is probably cheaper to hire help than it would be to buy one. -Any tasks that neither Joe or I want to do, we can pass it off to someone else. -The house will always be clean and there would be no scrambling with those surprise visitors. -Everyone, and I mean EVERYONE, complains about their ménagère. They either don't do things right or they don't do them well enough. -It's hard to trust people here as many are opportunists. We would have to be careful about what was accessible in our house. -You have someone extra in your home whether you feel like it or not that day. -It's $300/month that could be spent elsewhere. Over the course of a year, that would be 1 return ticket to Canada. So what do you think? To ménagère or not? Those of you that have been regularly following our blog know of our trials and tribulations we've encountered relocating to Africa. Housing has been our biggest dilemma and while we are still sorting that, we also had to deal with my immigration. Joe secured his residence card quite awhile back and in the meantime, we have been trying to figure out how to do the same for me. Because we weren't married, we couldn't follow the same procedure that most other couples do when moving to Gabon. We had heard that we might be able to secure a common law certificate which would be just as good as a marriage certificate so we followed that path for a few months. Protocol changes daily here and what worked for one person one day may very well not work for another the following day. Eventually, we were told they just couldn't figure it out. Joe and I knew this could be an issue ahead of time and being that we were already planning on getting married at some point we figured what the heck?! We were in a bit of a rush as my visa, which had already been extended once, was set to expire so we quickly jumped on board. We told our families and let everyone know that while we were having this wedding here we are thinking of it as solely for immigration and we would most certainly have a 'real' wedding at home with our friends and family present. 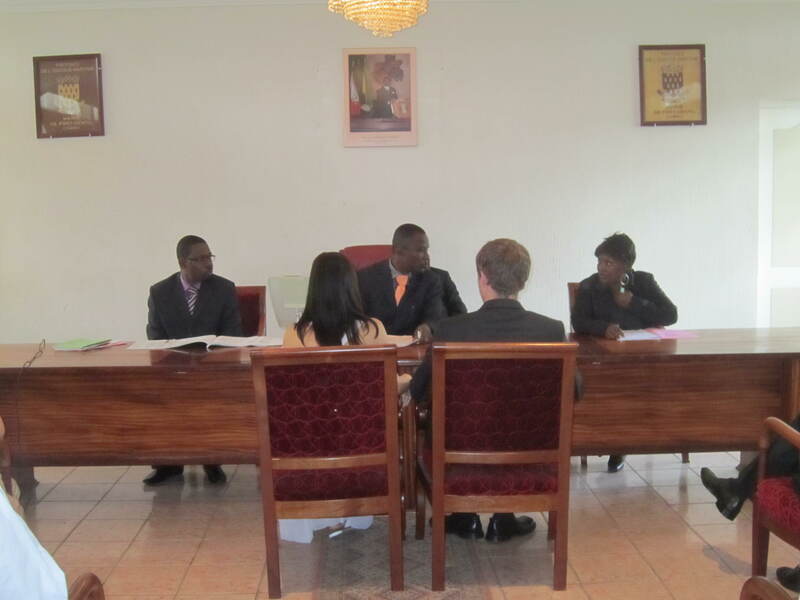 Everyone in Gabon must be married by the local mayor in order for the marriage to be legal. We had to have a wedding medical, which consisted of blood tests for HIV, syphilis, blood type and things that would concern me in case we ever want to get pregnant, and complete paperwork. (Polygamy is legal here and is actually an option on the marriage paperwork. For those who are wondering, we chose monogamy.) All of the paperwork was submitted to the mayor and we were told that we would be married on October 30 at 9:00 am. Funny enough, after we informed our families, Joe’s Grandma told us that her and Joe’s Grandpa were married that very day 64 years ago. Joe and I sitting front and centre in city hall. The ceremony was presided over by the mayor and 2 others. It was completely in French and while we understood most of it, we had our friend Tarik translate just so we knew exactly what we were getting ourselves in to. Tarik translating before exchanging rings. (I think we were laughing that the mayor reiterated several times that monogamy meant 1 man and 1 woman FOREVER!)" Disclaimer: Please do not judge me by my dress. I searched all of Port Gentil and came up with 2 white dresses. This was the better of the two. 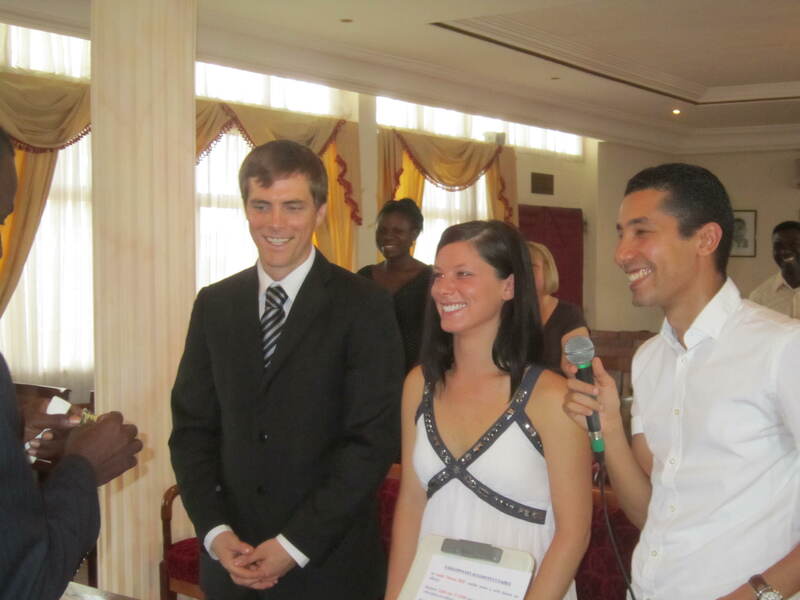 We said our “Oui’s,” exchanged rings, and signed the documents and are now legally married in Gabon. Afterwards, we went for champagne at a seaside restaurant and later out to dinner with the wedding party. The day was nice and relaxed but certainly not what we pictured our wedding day to be. 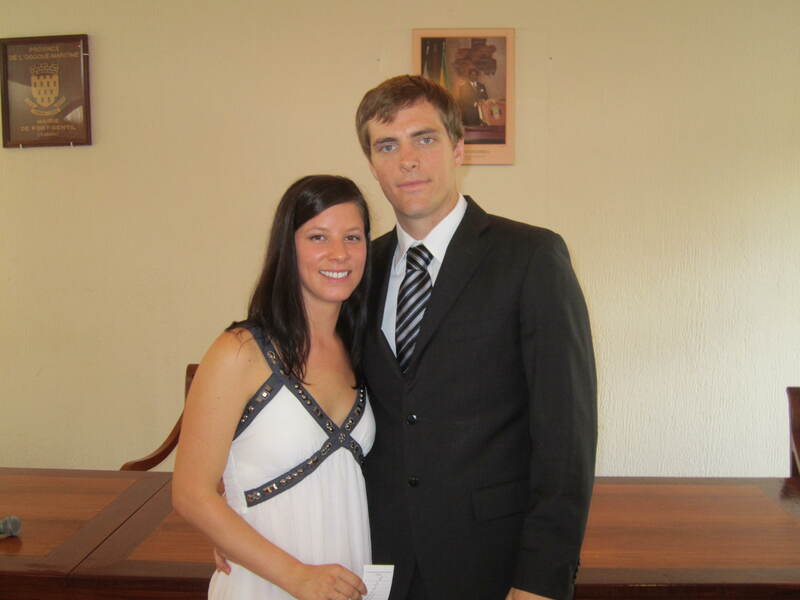 Luckily, we are happy to announce that we have begun planning our Canadian wedding for the summer of 2011!